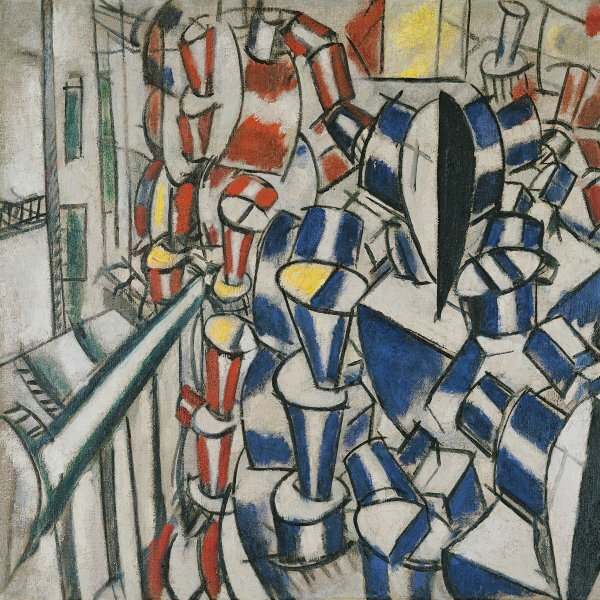 Fernand Léger’s origins lie in Cubism. After World War I he became extremely interested in themes of modern life and the beauty of the machine, a phase known as his “mechanical period”. The Bridge of 1923 combines a fragmented vision of the city with its surroundings. Some motifs, such as the buildings in the upper part, the volumetric landscape, the wedge-shaped chessboard and the discs arranged to form a bridge, had already appeared in previous works. Here they are juxtaposed in an abstract manner with no apparent unity, following pictorial solutions derived from Synthetic Cubism and Delaunay’s Simultaneity as well as from film editing. The work is entirely devoid of narrative elements, nor are there any figures located against the background. 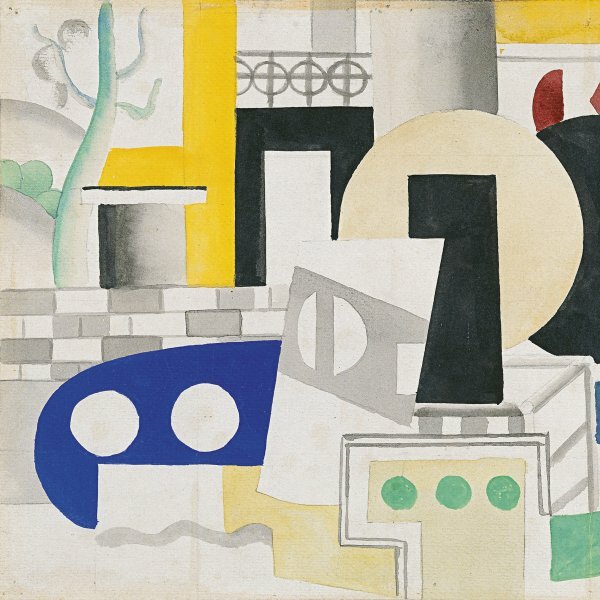 Once again Léger made use of contrasts between primary colours, curved and straight lines, and flat and three-dimensional forms to suggest the dynamism of the modern world. Towards the end of 1923 Léger designed the set for a laboratory of the future to be used in making Marcel L'Herbier's film L'Inhumaine. Constructed of painted wooden flats, this set was a realisation in three dimensions of the pictorial architecture he had developed as a painter in 1918-1921; it is an adaptation of the vocabulary of disks and colour planes used for the urban architecture and ship superstructures in the Tugboat paintings of 1920-1921, itself adapted from the disk compositions of 1918-1920. The Bridge is one of the paintings produced in 1923 which take as their subject either architecture alone or the confrontation of architecture and nature as a confrontation of flat colour disks and planes and bulging forms tonally modelled. Its flat planar architecture is closely comparable with that of Léger's laboratory set. For L'Herbier, Léger designed an interior which could be animated by lights and movement. The Bridge is both an outdoor scene and, because of the placing of the "foreground" area of abstract shapes below and of the two emerald green posts above, can be read as a view from inside out, a view perhaps behind the pilotis of an imaginary polychromatic Corbusian building. The work relates loosely to those canvases of 1923 which deal with urban and suburban buildings alone, but it relates most obviously to the revival of the Tugboat theme of 1920-1921, which culminated in the Large Tugboat of 1923 (Biot, Musée National Fernand Léger). It is as if a vertical slice had been taken out of a synthesis of that enormous painting and its precursors, including the Thyssen-Bornemisza Tugboat watercolour. The long horizontal wedge of the chequerboard reappears, sliding left to right across the composition as in the watercolour and its model, the painting in Grenoble. Here, however, it slices across a broad swathe of folded countryside, behind which is a backdrop of urban architectural forms rendered in brilliant red, green, black and white, like a detail of one of the enormous grain elevator-like edifices on the horizon of the Large Tugboat. 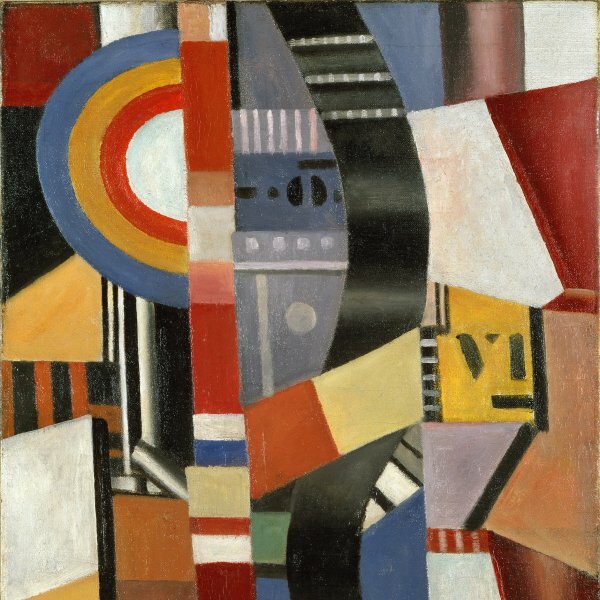 The flat coloured architecture of the "backdrop" also prefigures Léger's move into mural painting in 1924-1925; it echoes especially the architectural arrangement of shaped, brilliantly coloured panels which he exhibited as a first foray into this field with the sculptor Josef Csaky at the Salon des Indépendants of 1923, his preface to the sets for L'Inhumaine. The association between the idea of the interior and the lower area of The Bridge, comprising the chequerboard and the colour planes below it, is strengthened by the relation between this work and two still lifes painted in 1923, which use a comparable cut-out disk device. As in The Bridge, the inverted half-disk in these paintings contains a planar arrangement which contrasts sharply with its surroundings, as if it is a view through to abstract passages in another painting, and significantly in one of them a framed landscape hangs on the wall behind the fruit bowl, offering the illusion of a view outdoors. In the still life, the indoor/outdoor ambiguities are handled straightforwardly-the table-top still life is clearly indoors and the landscape with its frame is clearly a picture hung on the wall. In the Bridge, the lack of an easily legible table-top and still life, and of a window or picture-frame for the landscape exacerbates the ambiguity by adding a degree of uncertainty. The viewer is placed both inside and outside. On the other hand, it is possible to read the entire work as an outdoor view. Such a reading is supported by this work's relationship to a pencil drawing known as Study for Tugboat and dated "23", in which the cut-out disk device used in The Bridge is found again. In this drawing the planar arrangement below that spans the width of the sheet is closely comparable to the lower area of The Bridge. 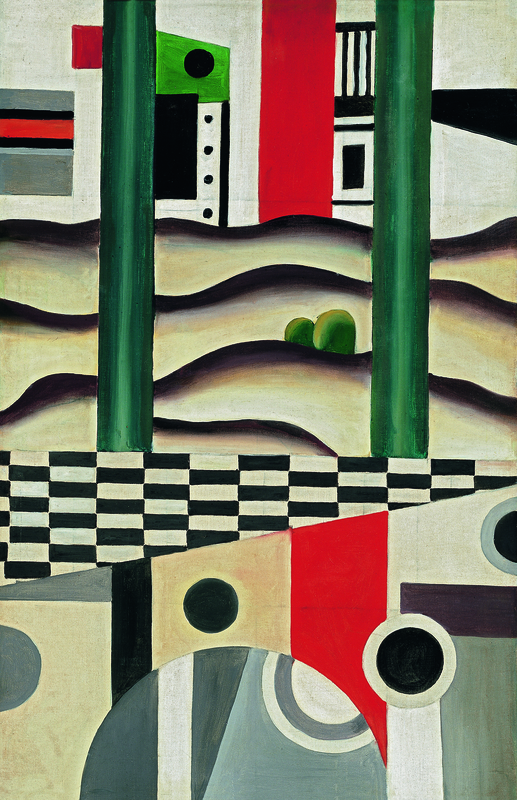 Here it reads as the elements of the tugboat seen from the outside, but within the cut-out disks (of which there are now two) Léger has drawn little medallion landscape views, so that they can be read paradoxically as port-hole views from inside the cabin out. The ambiguities proliferate with the contrasts. It should, incidentally, be added that the obvious tugboat subject of this drawing, which justifies its title, suggests that the "bridge" referred to in the title of the Carmen Thyssen-Bornemisza painting is the bridge of a tugboat. Such an interpretation, of course, would change the vertical green posts from imaginary Corbusian pilotis to the stanchions or masts on the tugboat's superstructure. Both the arrangement of the composition to give the impression of abstract shapes slicing across each other and across landscape forms, and the specific device of the cut-out disk, link this work with Léger's other film project of the period, Ballet mécanique. This film, made with the American Dudley Murphy, seems to have been virtually complete in its first form by the summer of 1924, but was not projected for an audience until the opening of the Internationale Ausstellung Neuer Theatertechnik organised by Friedrich Kiesler in Vienna, which took place in September of that year. According to Léger, he began work on Ballet mécanique in 1923, probably around the time of his collaboration with Marcel L'Herbier on L'Inhumaine. The film contains sequences in which a flat patterned object, out of which shapes have been cut, swings across in front of things, most notably the head of the model Kiki. As in The Bridge, cut-out shapes offer a contrasting view through, while the slicing effect achieved is analogous to that of the contrasting areas that slice across the vertical format in the painting. The relationship between The Bridge and Léger's work late in 1923 on L'lnhumaine and Ballet mécanique indicates a date towards the end of the year. This cannot, however, be corroborated definitively. The Bridge was one of a batch of nine paintings and eight drawings which came into Kahnweiler's galerie Simon stock in 1923; I have been unable to establish in precisely which month. AII of the paintings were works of 1923, which suggests that the date of entry was later rather than earlier in the year. They included examples of the 1923 paintings which concentrated on architecture, and the two 1923 still lifes with cut-out disk devices discussed above. The work is presented very much as a design, and has been made as if designed, that is, as if based on a meticulous preliminary plan whose function is precisely that of the designer's blue-print. 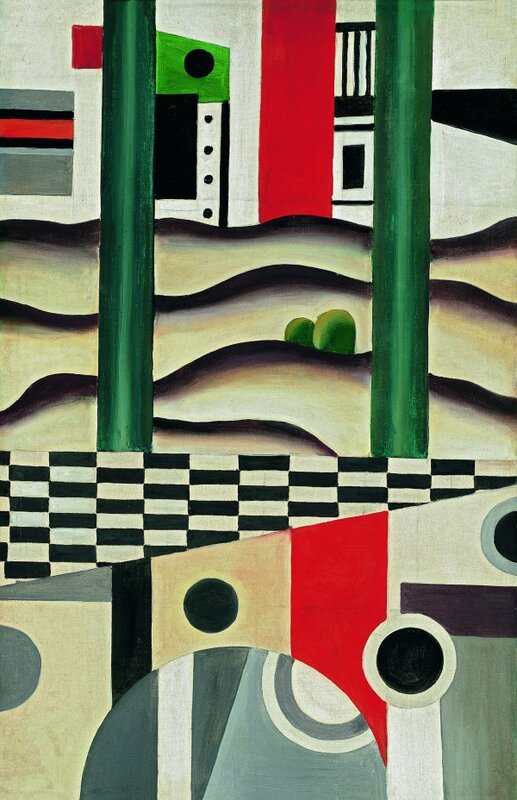 No study in any medium survives for the picture, and, unusually for Léger's practice, there is only one painted "state". It can be assumed, however, that the canvas was worked up from a closely related study, since there are clear signs on the picture surface of squaring-up in pencil: these are still plainer under infrared. Léger has transferred the idea from paper to canvas, and has done so with such certainty that there are almost no visible pentimenti. By 1923 Léger was prepared to make his commitment to a mechanical working process with industrial standards of finish a matter of public record. Florent Fels quoted him comprehensively on the topic in an interview published by the periodical Les Nouvelles littéraires in June 1923. Léger drew a simple analogy between the making of "beautiful objects" in painting and the perfectionism of "the worker" who "would not dare deliver a product other than spotless, polished, burnished." He acknowledged that "painting is judged to the decimetre, where the mechanical is judged to the tenth of a millimetre", but could still write of artists: "There are workers and engineers." Rousseau, for him, was "a worker", Cézanne "a little engineer". He did not make claims for himself. One must suppose that, in the designing and painting of a work like The Bridge, he aspired to the status of both worker and engineer. If the images are being used for purposes other than those described above in paragraph 4, prior written permission from the Fundación Colección Thyssen-Bornemisza is required. The reproduction of the images made available free of charge by the Fundación Colección Thyssen-Bornemisza for the purposes described in paragraph 4 are protected by copyright. In Spain, copyrights are managed by an independent body called the Visual Entidad de Gestion de Artistas Plásticas (VEGAP). The material may not be reproduced without first obtaining a licence from VEGAP, (for more information go to www.vegap.es). Any previously licensed reproductions of the copyrighted images, whether in part or in whole, must mention the copyright holder and the following note: Provenance: Carmen Thyssen-Bornemisza Collection on deposit at Museo Thyssen-Bornemisza, Madrid.